Stanford University researchers built the remotely-controlled robot in order to test how humans reacted to it in a natural setting. 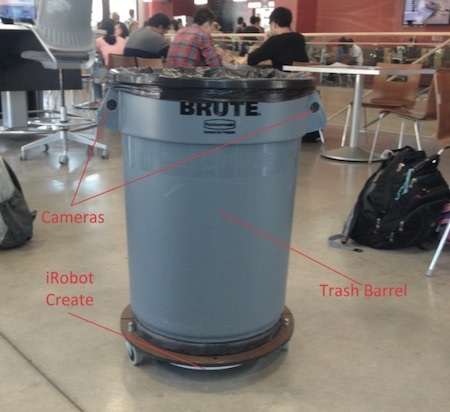 Several groups of people willingly tossed their trash into the trash can robot; others simply ignored the robot. But some people seemed compelled to give the robot what they thought it wanted — trash — without having any on hand. One group of people tore off the bottom of their order receipt to “feed” the robot. When researchers asked them about that action, they said they thought the robot “wanted” trash. She looked up the beach for the local trash can. She spotted it loitering near a pair of fisherman, who stood in hip boots in the gentle surf. She called out. "Trash can!" The can pivoted on broad rubber treads and rolled toward her voice. It snuffled across the beach, mapping its way with bursts of infrasound…. Via A Robotic Trash Can in the Field and Discover Mag.